As we reported a month ago, Bosch has confirmed they are working with Tesla to develop automated driving systems for production vehicles. To make the test vehicles ready for automated driving, they first had to be retrofitted. Fifty new Bosch components were installed in each car. They included a stereo video camera (SVC), which the car uses to recognize lanes, traffic signs, and clear spaces. The Bosch SVC is the smallest stereo camera system for automotive applications currently available in the market. Its compact design makes it easy to integrate into vehicles. In addition to the camera, 1,300 meters of cable were laid in each car and fixed in place with 400 cable ties. “After some 1,400 hours of work on each of them, the test vehicles are ready for highly automated driving,” Hoheisel says. Thanks to Bosch technology, the two Teslas can now autonomously drive from on-ramp to off-ramp without the driver needing to constantly monitor them. This transfer of responsibility from the driver to the vehicle explains why so much time and effort is necessary for the retrofit. Highly automated vehicles must be capable of operating safely even if a component fails. The only way to achieve such operational reliability is by a design strategy that includes redundancy in safety-critical systems such as braking and steering. For example, both test vehicles feature both the iBooster electromechanical brake booster and the ESP braking control system. These Bosch components can brake the car independently of each other, without any need for driver intervention. “For Bosch, the principle here is safety first,” Hoheisel says. Back-up systems are also available for the two test vehicles’ power supply and vital ECUs. 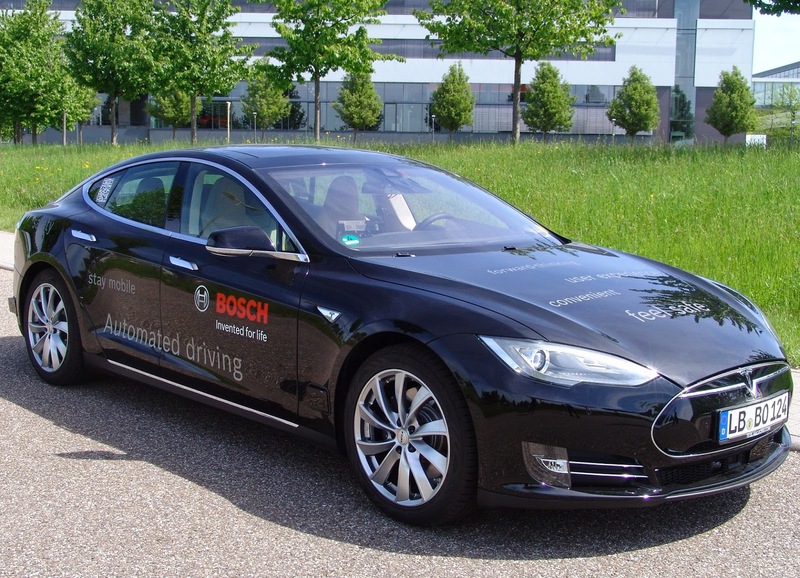 Since 2011, Bosch has had two teams – on two continents – working on automated driving. At the Abstatt location in Germany, Bosch engineers are working on system integration. Their colleagues at Palo Alto in California’s Silicon Valley are driving forward work on function development. The two teams receive support from roughly 2,000 driver-assistance engineers who work for Bosch around the world. To make it as easy as possible for the two teams to share their results, Bosch uses identical test vehicles. Hoheisel explains why Bosch opted for two all-electric Model S vehicles made by the U.S. automaker Tesla: “They combine two automotive industry trends: electrification and automation.” This presents a particular challenge, he says, but one that Bosch relishes.